Explanation: Gliding through the sky on Wednesday evening, February 20th, a first quarter Moon seemed to run over bright planet Saturn as viewed from much of North America. 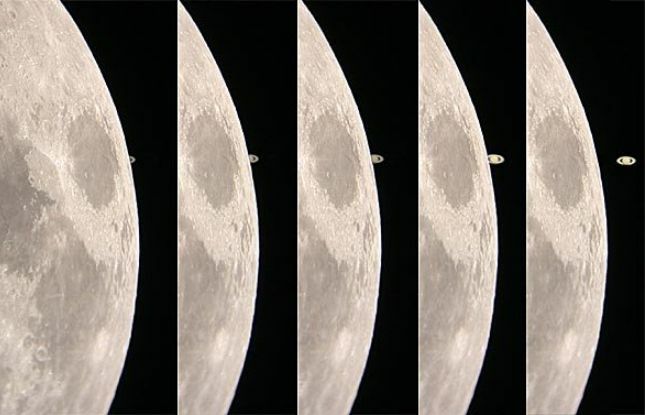 In this sharp sequence of telescopic digital images from the Powell Observatory near Louisburg, Kansas, USA, Saturn is seen reappearing from behind the bright lunar limb over a period of about 2 minutes. The ringed planet emerges above the dark, smooth lunar Mare Crisium (Sea of Crises). This lunar occultation was widely anticipated in part because the ringed planet and the brilliant Moon are both spectacular celestial sights. Now, European sky gazers will have their turn as the Moon occults the Solar System's largest planet, Jupiter in early morning hours on Saturday, February 23rd.